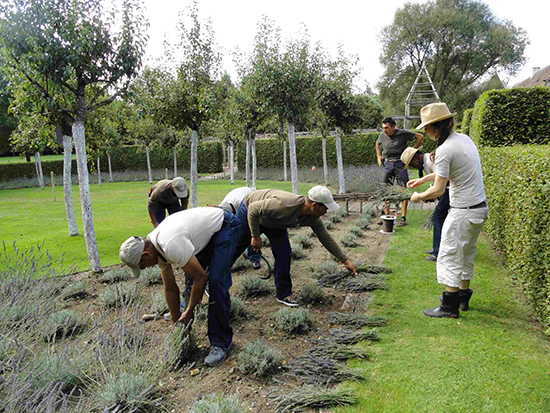 Our head gardener, Liesl van der Walt and her team are at the Prieure Notre Dame d’Orsan in Maisonnais, France. This is home to architect Patrice Taravella, who designed our gardens five years ago. Liesl shares form her travel diary. Sunday: We were collected at the airport by Valentine, a student in the Hotel at Orsan. The only vehicle Patrice could hire locally to transport my team of seven was an 8 seater ambulance! In Orleans we visited an impressive cathedral and later had crepes(pancakes) for dinner at an old marketplace in Lignieres. I was inspired by the wooden flowerboxes hanging from the roof, a great idea for our strawberries in the Puff Adder. Way past sunset and very tired we finally reached our hostel in Touchay. 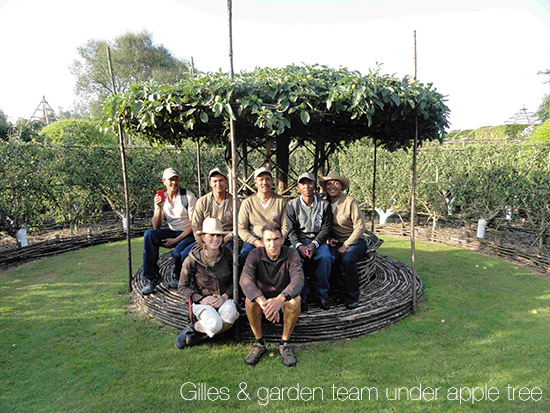 Monday: Our first day started with a garden tour by gardener, Gilles. He explained all the different meanings and themes in the garden and I was amazed at how much the garden changed since my last visit two years ago. 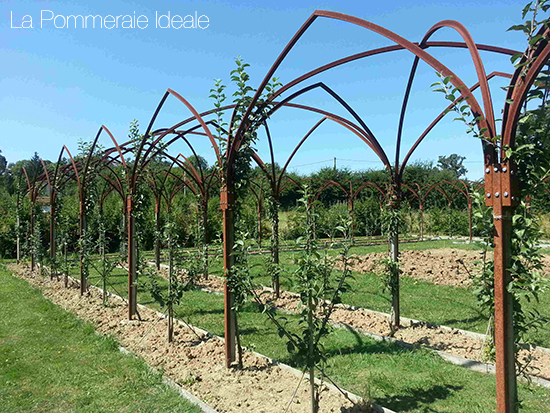 The new vegetable garden is full of beautiful wood structures and Orsan-energy, the berries prettier than ever and the pruned double pear tree with white lime-washed trunks still breathtaking. We cut back the Lavender grossa and hung the bundles of flowers in the hotel entrance. Late afternoon we visited the Arboretum de la Sédelle with its huge collection of Oak trees and Acers (Maple trees). The owner Nell Wanty, originally from Cape Town, takes care of the garden together with her French husband, who planted the tree collection over the past twenty years. Tuesday: This morning after we finished working the lavender patch, Gilles showed us his mole-catching technique and demonstrated how they prune using ladder-like structures. We lime-washed some pear tree trunks, tied hessian around young tree trunks for protection and added sticky paper strips to catch crawling insects. 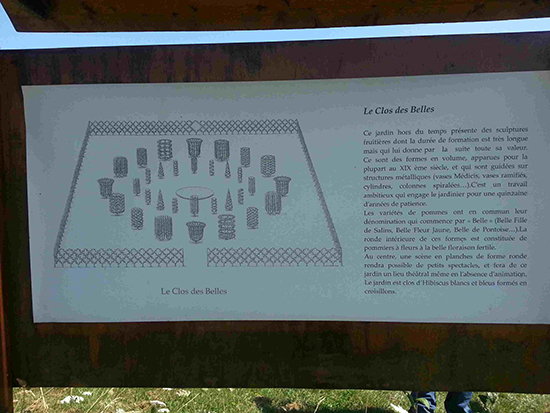 In the afternoon Gilles took us to a relatively new garden (between 3-5years old), La Pommeraie Ideale. 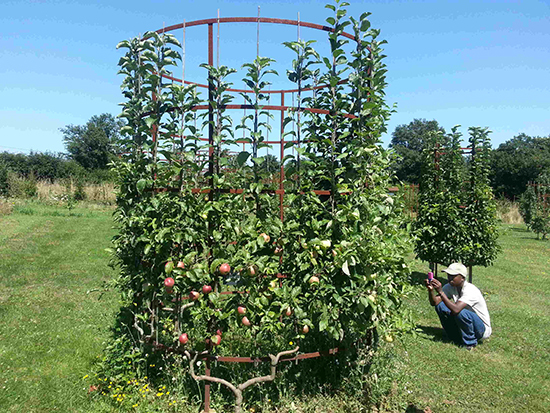 This garden has a selection of apple trees, some older varieties used for cider, an old selection of Reinette and a forest of original Malus sylvestris species. In this orchard they use many different pruning techniques, even more than I have seen in Versailles. Wednesday: Today we pruned roses, red- and white currents and black gooseberries. Later we went with Gilles to Marais de Bourges. Hundreds of years ago monks drained this march land with canals, created islands of fruitful soil for growing fruit and vegetables. It is still being used like that up to this day. Thursday: In the vegetable garden we made a bamboo shading structure for young seedlings and built four different wooden structures and plaited willow branches. This evening we said our goodbyes to Orsan with a last meal with Patrice.